I have seen you many times during my peregrinations around the area where I live and where you are confined. A few times I have bent down to touch your forehead and your cheeks, acknowledging and celebrating your presence and that of other members of your docile and beautiful species in the urban jungle members of my species have built. The other evening I thought you were looking at me for the duration of those few seconds as I moved from the extreme left of your line of sight and towards the centre. You followed me with your large, expressive eyes and when I tried to stroke your head and neck you seemed to acknowledge the all too brief ministrations – by someone from a species that in your experience has an altogether different agenda – with noticeable twitches of your amply large ears. It was the first time I’d seen you standing untethered, on a lane next to where you are usually confined. You were, in other words, free to go where you pleased. No human enslaver seemed to be paying attention. Even if I could have spoken your language, Cow, you might have demurred. Confinement, imprisonment or slavery are soul-destroying. It is not merely the body that experiences restrictions but the spirit as well. Unless you were a character in George Orwell’s Animal Farm or Richard Adams’ Watership Down or some other anthropomorphising fictional work, you and members of your species, I’m sorry to say, have been and are pretty much done for. Moreover, Cow, and I was obviously ignoring what you might instinctively have realised: even if you could run or walk, where to? To be sure, there actually are a few – very few – small, grassy patches within a couple of kilometres of where you live. But you would be unwelcome there: in fact, your way would be barred. Even if you, my friend, were to make your escape, what of the dozens of other members of your species enslaved by humans within a couple of square kilometres of you? How and where to can all of you escape? In your wisdom you discerned that already, perhaps? Having said all this, Cow, I must confess that I am a lacto-vegetarian. I live with my parents who consume milk stolen from members of your species as well as by-products thereof such as yoghurt. I shall allow myself this poor attempt at a pun by saying it must curdle your blood thinking that the milk meant for your – perhaps many a murdered – children are being boiled and set to curdle for the delectation of your slave-drivers and their customers. Dear Cow, in India you are deemed a Hindu Goddess. But no benefit accrues to you from that status of which you are no doubt oblivious. Yes, a few caring dairy farmers observe an annual spring festival ritual of dressing you up and feeding you some dainties, but that is it. The rest of the 365 days minus the few hours or, more likely, minutes when you might be the object of adulation, your life is one of untold misery. 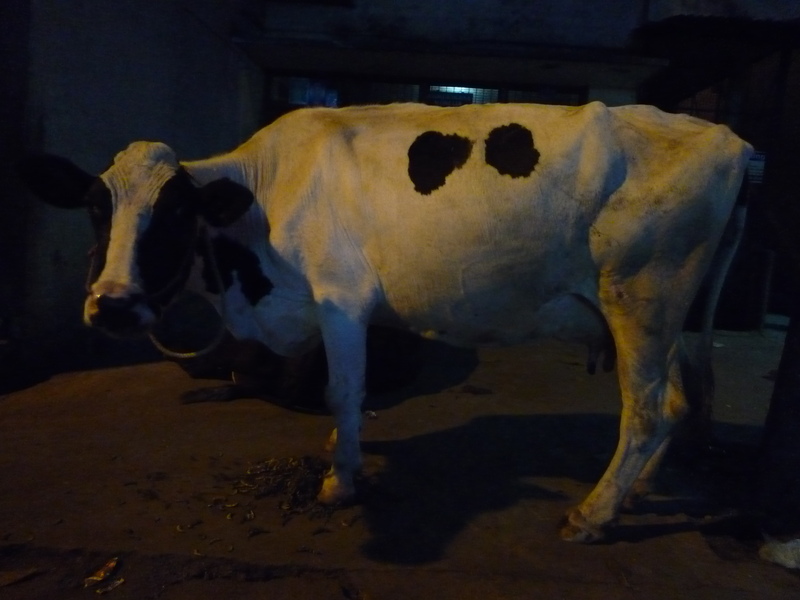 I have previously written about the plight of your kind, Cow: “An Indian Would-Be Vegan’s Defence of Beef-Eating” (https://walkerjay.wordpress.com/2012/10/01/an-indian-would-be-vegans-defence-of-beef-eating/) and shall not repeat the arguments I set out therein. Suffice it to say, Cow, and I hope you will not be shocked by my making this mere rhetorical statment: I’d sooner eat a part of your flesh so long as you were killed with a short sharp cut or strike than see you suffer for the rest of your life – meaning many, many more months or years of your enslavement until you stop lactating and then your abandonment on the streets of Bangalore, to scrounge around among mounds of sickening rubbish until your eventual and excruciatingly painful death. 🙂 This one will remain relevant forever (unfortunately). No hope of a positive evolution even in the distant future?